Jinxy Knows Best: Benefits of Kicking the Bottled Water Habit - And How To Do It! Benefits of Kicking the Bottled Water Habit - And How To Do It! There are several important reasons to wean yourself off bottled water. First, it is a HUGE environmental issue. Energy is used to both manufacture the bottles and transport it long distances. Worse yet, according to the Container Recycling Institute, 86 percent of plastic water bottles in the U.S. aren’t recycled. That means these bottles either end up in landfills or are incinerated, which releases toxic gas and ash. And a third bonus reason to kick the bottled water habit is that it is EXPENSIVE!!! Bottled water is hundreds of times more expensive than filtered tap water. So, what can you do? The first is to filter your own tap water. The most convenient method is to use a filter mounted on your kitchen faucet. Another option is to use a refrigerator pitcher or dispenser. 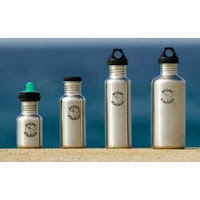 Then, for portability, carry your water in your own non-plastic, refillable bottle. Some great stainless steel bottles are made by Sigg and Kleen Kanteen. So next time you reach for some cool water refreshment, think of your health and the environment and ditch the bottled water habit! I didn't know these things. I had been wondering if I should switch to bottle water, but after I read this I realize that tap is better. Thanks for sharing.